Sample the world of opera. Known and rising, famous and ambitious, sophisticated and casual destinations invite you to be their guest. All our music tours can be found here. Last minute & special trips In the Hamburger Elbphilharmonie one of the best countertenors of our time is singing: Philippe Jaroussky. „Il barbiere di Siviglia“ & "Il pirata" Begleiten Sie uns vom 21. bis 26. September 2019 auf unserer musikalisch-kulinarischen Reise von Palermo nach Catania. 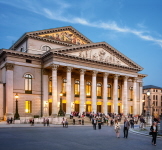 September 21st to 30th, 2019 “Der Ring des Nibelungen” at the Staatsoper Unter den Linden in Berlin. To celebrate every special event. Birthday, wedding, Christmas, or just to surprise your family or friends, offer a musical gift. A dedicated opera travel operator removes you from your everyday life and embeds you into the world of opera. We offer sophisticated tours composed around classical music, special concerts and music festivals. The most important travel information about your hotel, your tickets, your flight, private transfers, insurance and more can be found here. Welcome the year 2020 with a musical journey through the most beautiful opera houses and concert halls of Europe's best.